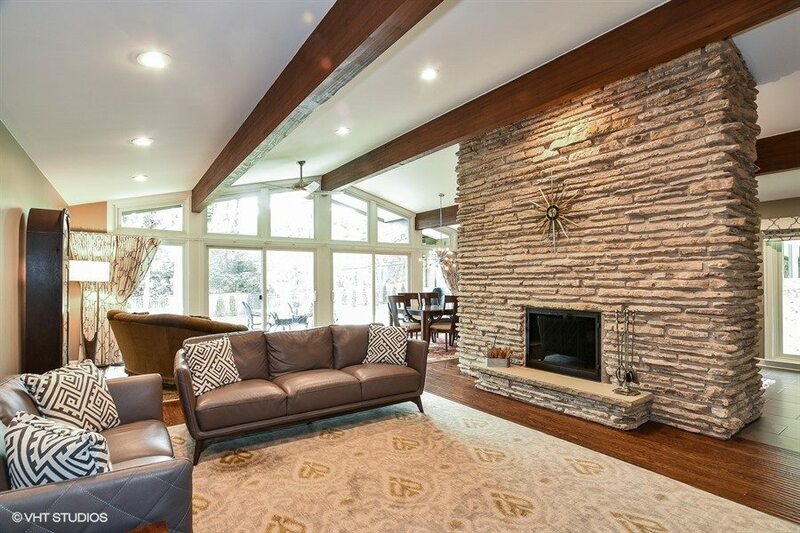 Freshly remodeled mid-century modern Lake Forest ranch with dramatic vaulted ceilings overlooking the backyard with expansive fieldstone patio, exposed wood beams, artisan hand-scraped hardwood floors, and central stone fireplace. Located on a quiet tree-lined street. 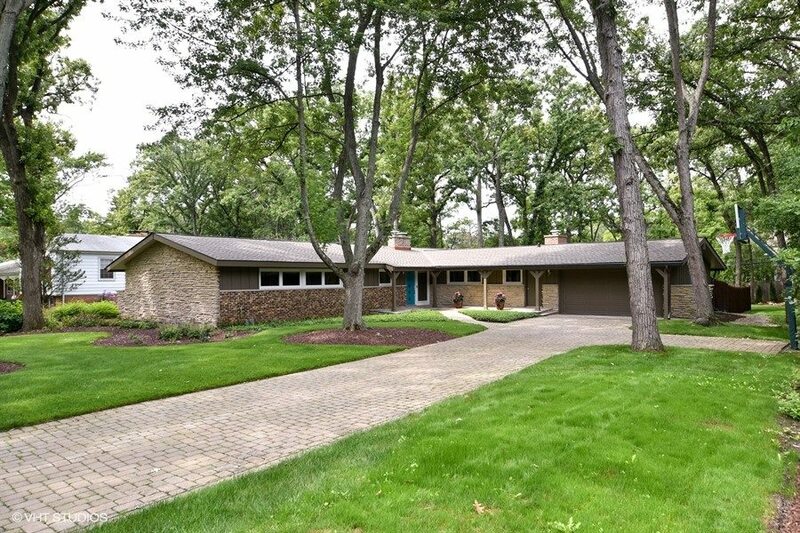 Remodeling includes new interior finishes, new gourmet kitchen and modern baths, freshly painted inside and outside, newer windows and sliders, and new high definition composite roof. 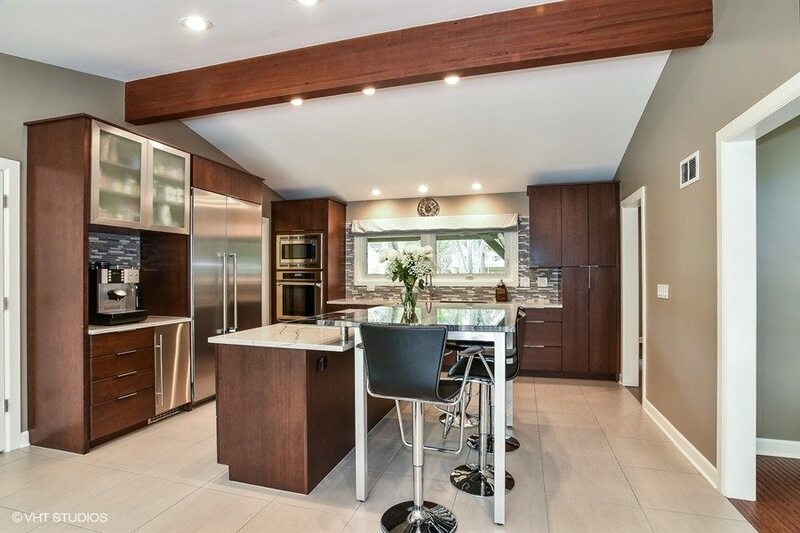 The new gourmet kitchen with eat-at island contains Thermador appliances, Scotsman Icemaker, whole kitchen water filter, and Induction cooktop. 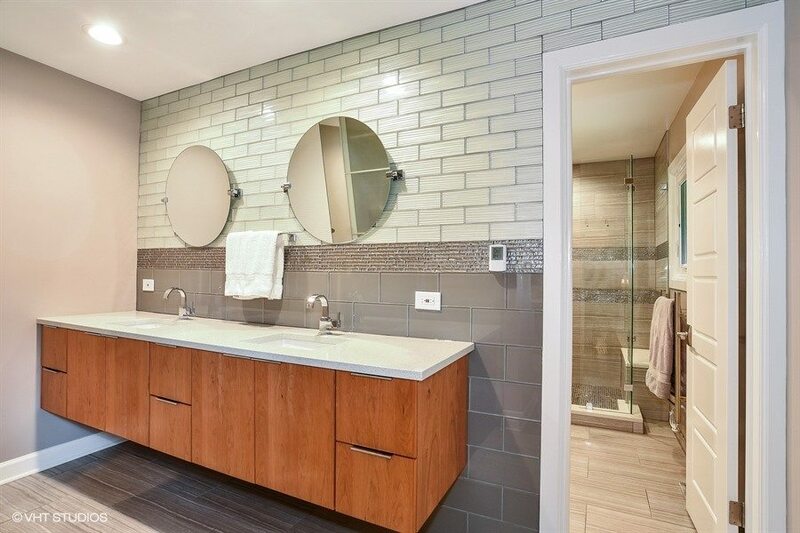 New master bath with walk-in shower, dual floating vanity, heated floors and towel rack. Updated plumbing to copper. New fireplace doors, Nest Thermostat, first floor and basement laundry, new front door. This beautiful home illuminates with a lot of natural light by day and gorgeous light fixtures and lots of LED can lights by night. The two flat panel TV’s will convey with the house. Pride in ownership! 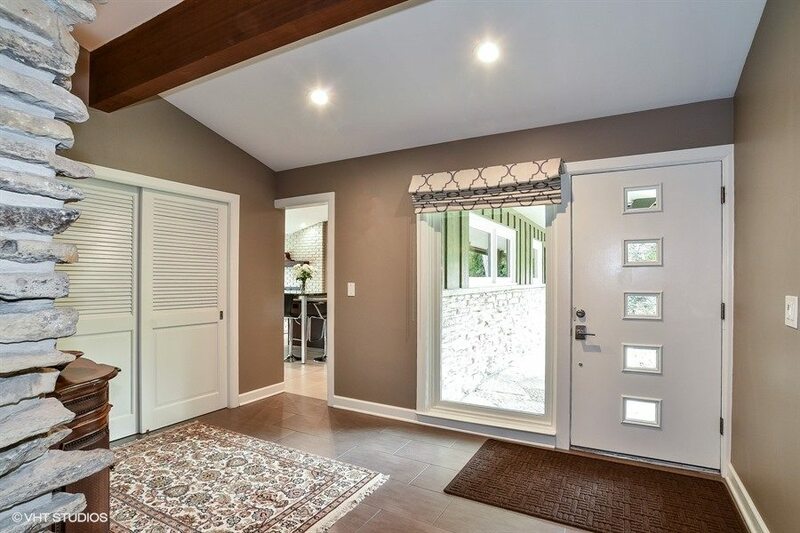 Dramatic entry into this fabulous home, with new front door, porcelain tile floor, vaulted ceiling and a large coat closet. 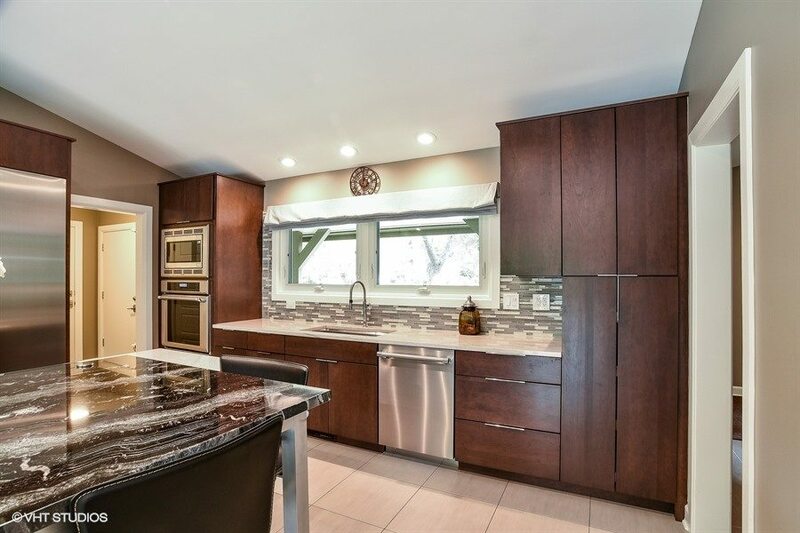 Completely remodeled gourmet Kitchen with eat at island with quartzite and granite counters, Thermador appliances, downdraft with remote blower to the outside, Scotsman icemaker (gas plumbed to island for future flexibility). 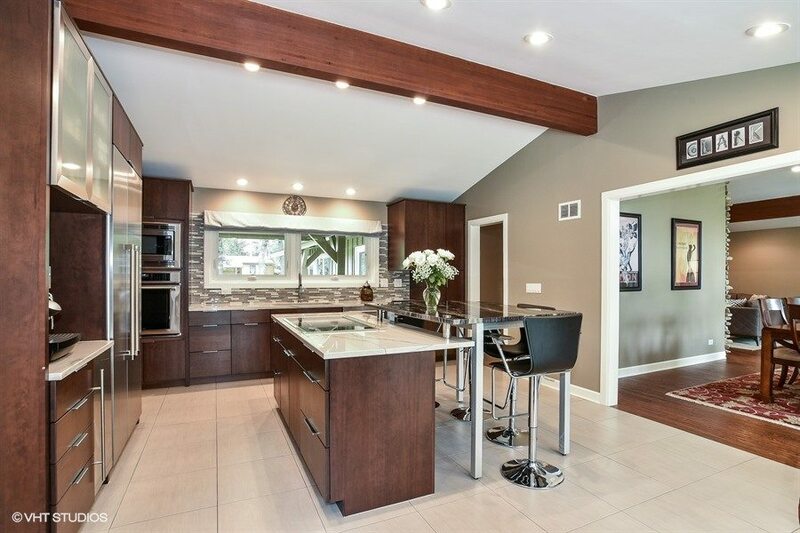 Bright and spacious Kitchen opens to the Dining Room for easy entertaining. 20″ x 20″ porcelain tile floors, recessed lighting, vaulted ceilings. New wood cabinets and beautiful tile backsplash. The Kitchen offers a good sized built in Pantry with a larger Pantry located in the adjacent Mudroom. 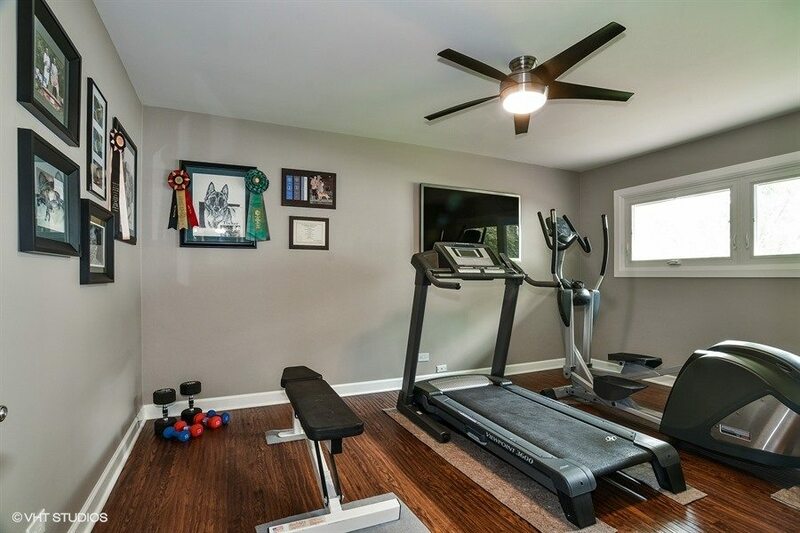 Additionally, a laundry room has been added for convenience … large laundry in finished basement. Located adjacent to the Kitchen, can be a Den or large Eating Area. 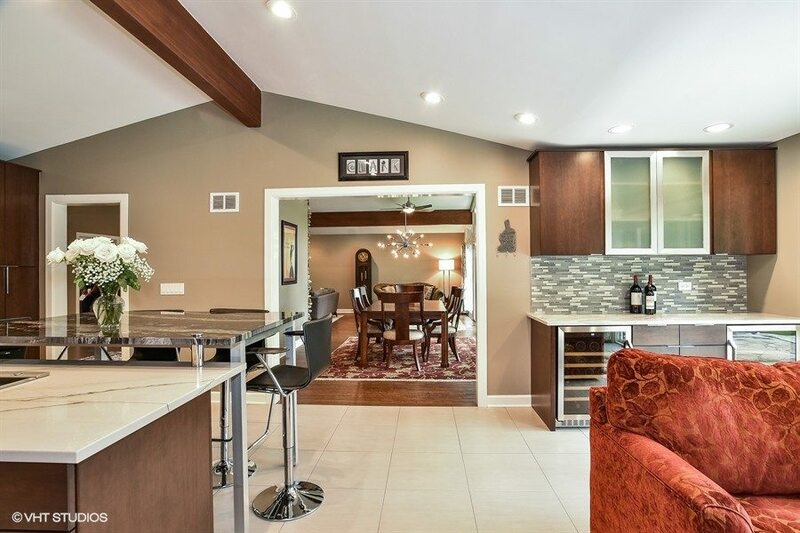 Featuring a brick fireplace, large bar area with quartzite counters and 2 wine coolers that remain with the home. 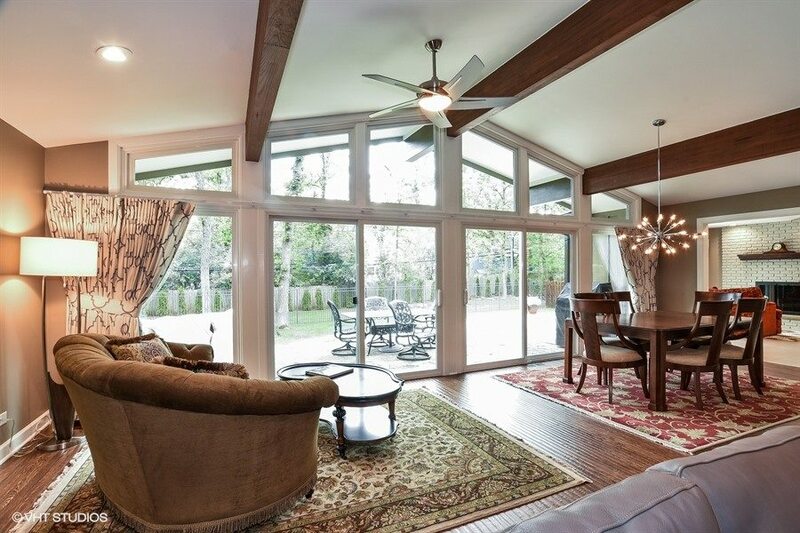 Large sliding glass door to amazing back porch. Located right off the Kitchen, the Dining Room is combined with the massive Living Room to create a wonderful space for entertaining. A full wall of floor-to-ceiling windows with sliding glass doors brings in a ton of natural light. Artisan hand scraped wood floors with Swedish finish and vaulted ceiling create a wonderful setting. Combined with the Dining Room, this large space continues the hardwood floors through to the 4 bedrooms on the main level. 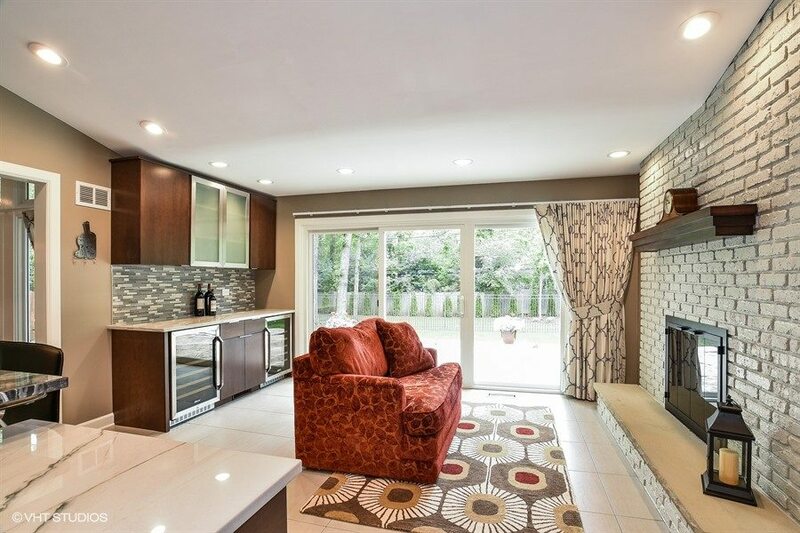 Natural light from wonderful backyard with access to the natural fieldstone patio. 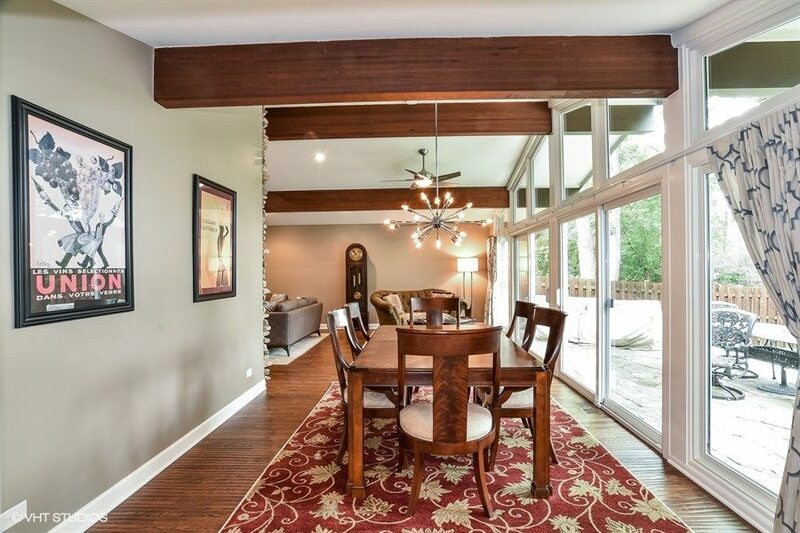 Bright and spacious living space with vaulted ceiling, exposed wood beams and central stone fireplace. 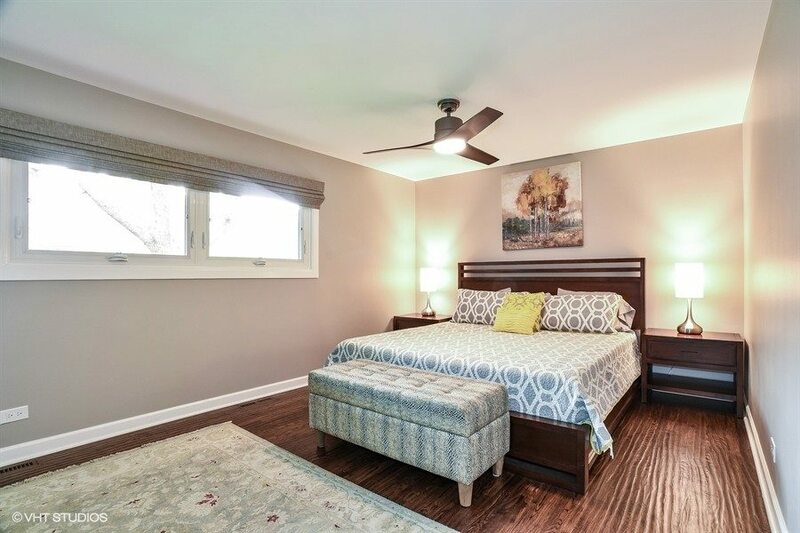 Gorgeous master suite with continuation of hardwood floors, ceiling fan and contemporary closet system that separates bedroom from Master Bathroom. Brand new Master Bathroom with dual floating vanity, beautiful backsplash and continuation of the large closet system. 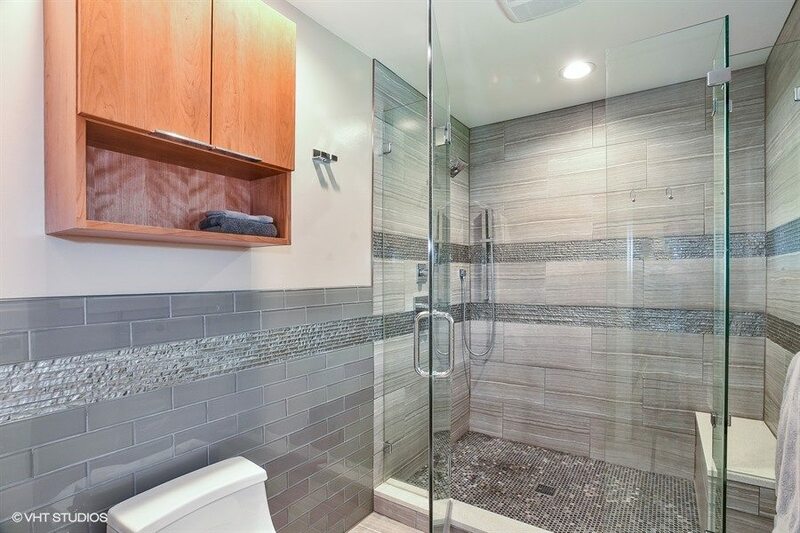 Spectacular walk-in shower with amazing tile work, heated floor and heated towel rack. 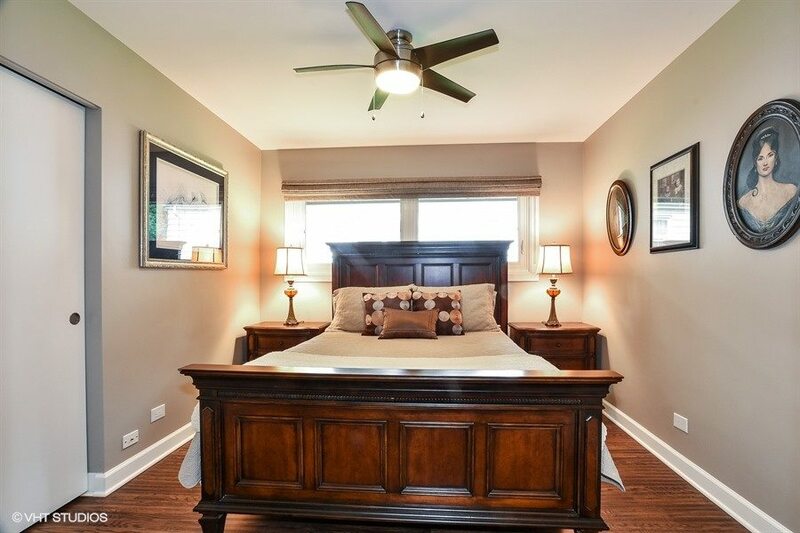 Hardwood floors, ceiling fan and large closet. Hardwood floors and a large closet. 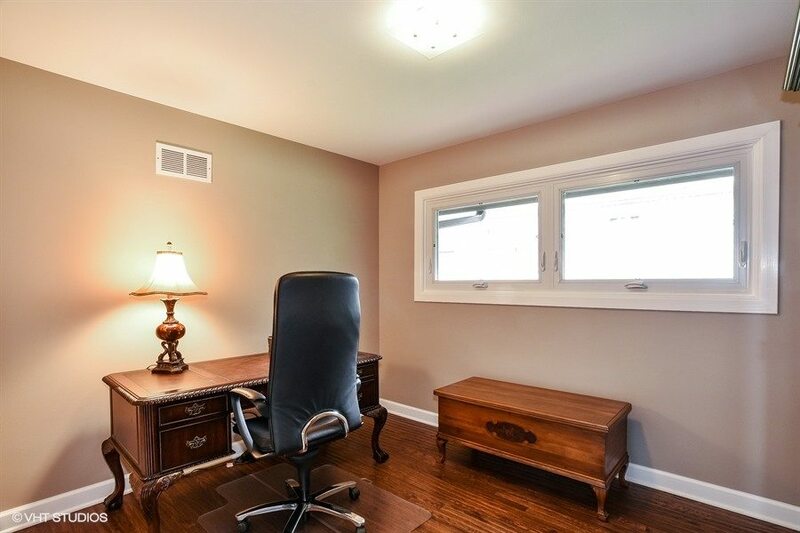 This bedroom is adjacent to the Living Room and makes for a nice Office space. 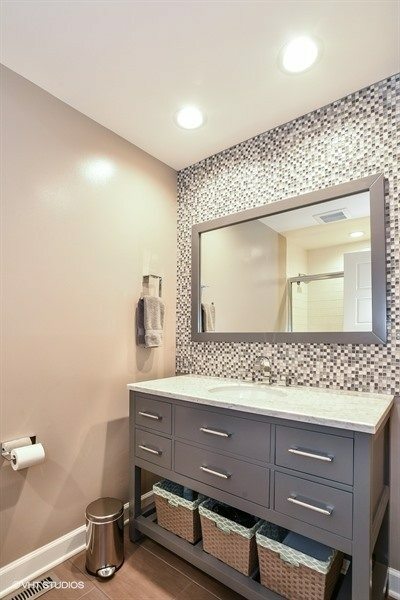 The 2nd Bathroom located on the main level features a soaking tub, porcelain tile floors and vanity with granite countertop and tile backsplash. 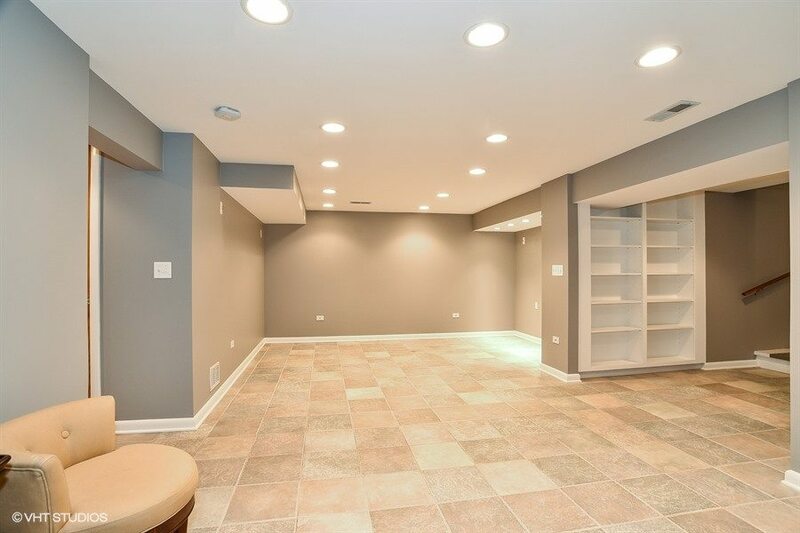 Spacious finished basement includes this large rec room, a finished bathroom with pedestal sink and large shower, a large laundry room and plenty of storage space. 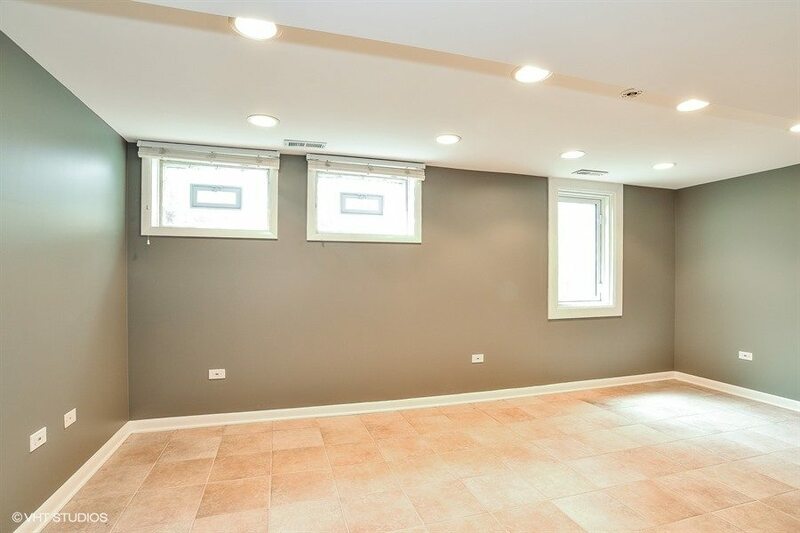 Located in the Basement, this large 5th Bedroom features ceramic tile floors, recessed lighting and large closet. 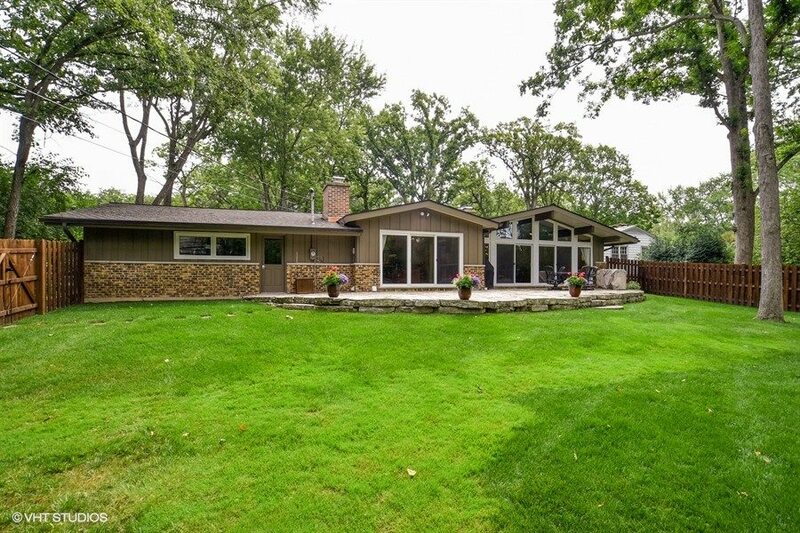 Professionally landscaped, this backyard features a large natural fieldstone patio. The rear of the lot was recently cleared, sodded and landscaped with installed drainage.